Tom Davis, Secretary Michelle Wyckoff, Board Members Theresa Weber and Rhonda Uhland. basket there for residents to put their mail in that Linda collects and takes to the Post Office for them. was no meeting in December. well together and things are going well. Financial Report: We still have three rooms available with tentative possibilities to fill all three. Mike moved, Rhonda seconded to approve the 2016 budget as amended, motion carried. spring weather to come to begin the project in earnest. Soon residents will be able to see real progress. The Board wishes to thank everyone who so generously gave in response to the mailing. equipment for use by the residents, unless we receive donations for the repair. of all areas of the facility. 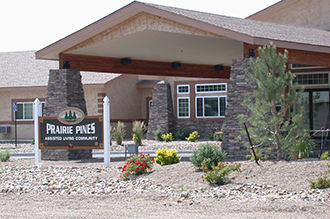 Southeast Health Group from La Junta has asked for a service agreement with Prairie Pines for use of the pool for their physical therapy patients. They will bring two people to assist them in the pool, and pay a fee for each person they bring. With no further business to discuss, the meeting was adjourned at 8:40 p.m. The next meeting will be February 18th at 6:30 p.m. Pending approval, these minutes are unofficial.